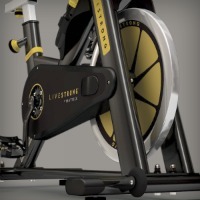 The Livestrong E-Series Indoor Cycle is designed for high-octane group exercise, yet offers the comfort and quiet performance you want for solo training sessions. The E Series has an eye-catching high gloss black steel frame with zinc oxide coating and polyester powder coating with attractive yellow decals. 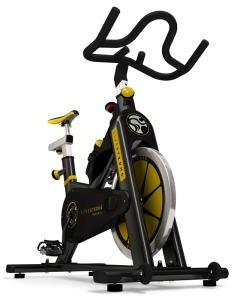 With an all-steel frame with integrated sweat guard, the Livestrong E-Series Indoor Cycle is built to handle constant, heavy workout sessions in a club setting, with a warranty that covers use up to 6 hours a day. The multi-ribbon (Kevlar) belt system and 40-lb flywheel are ideally matched for superior smooth pedaling performance. The Livestrong E-Series exercise bike features a reliable and oversized bottom bracket built with two SKF hub bearings, and a crank assembly with four SKF precision bearings for rugged durability capable of handling strenuous hill climb rider positions. 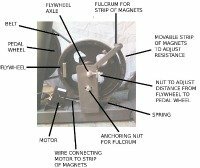 The cantilever brake system has a pull-up operation for rapid stopping of the flywheel with minimum effort. The dual SPD and cage pedals are designed to work with the Shimano 51/55 cleat systems of pro cycling shoes, as well as with standard exercise shoes, so that both advanced riders and beginners can use this bike. The non-slip handlebars support a range of riding techniques adjusting to six positions. The sports saddle has anatomical cutouts for superior comfort, and the aluminum seat and handlebar posts have adjustments at ½" increments. Pleasing a world-class athlete such as Lance Armstrong requires only the best engineering effort, using high quality components and offering superior comfort for long training workouts. If you demand the best in your home equipment, this Lance-inspired cycle is the one for you. 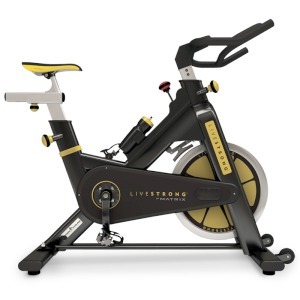 Priced at $1,395, the black-frame Livestrong E-Series Indoor Cycle differs from the $1,695 S-Series that comes with a 3" x 2" training computer, 4-way handlebars, stronger bottom bracket and crank assembly, and a platinum finish. 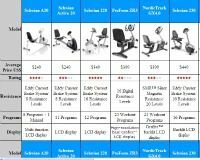 Otherwise, the specs on the bikes are the same, and you will save about $300 by choosing the E-Series.